This album in the series “Songs by Wandering the Globe” focusses on Brazil. 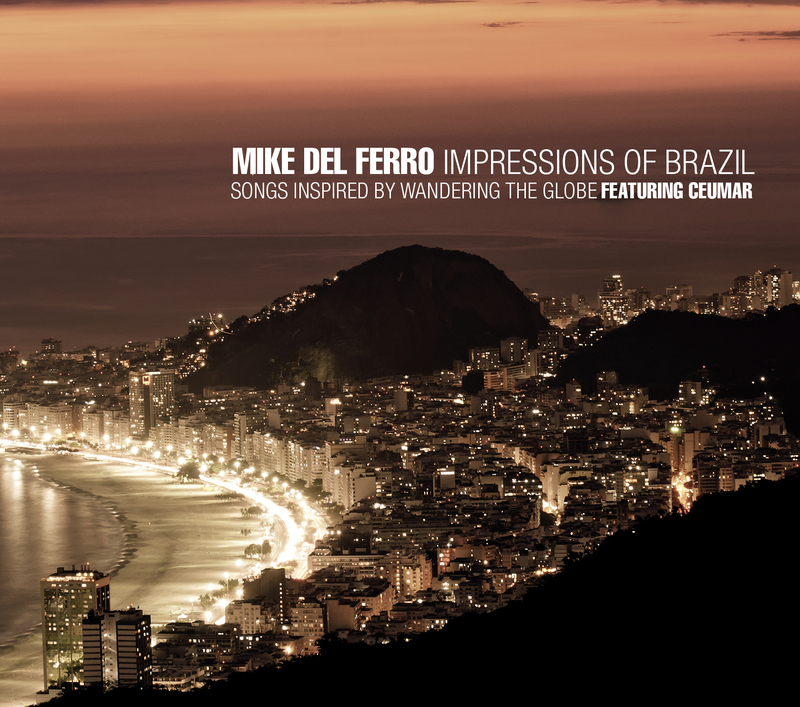 Mike del Ferro’s passion for Brazilian music has led to many visits to the Country, and he has been collaborating with countless Brazilian artists. In 2005 he met vocalist/guitarist Ceumar in Sao Paulo, who currently is based in the Netherlands.This album is a result of their unique collaboration in both Europe and Brazil. Wonderful, it gives my heart a vib. Nice Mike, I really enjoyed this! Wonderful; lyrical, creative, and swinging..... what a combination ! "Their Braziljazz changes between dapper, pacy and percussive." ""The overture is what you would expect from a CD that is called Impressions of Brazil: it is so melodious and cheerful, lighthearted and dancing""
""The extremely fine 'Introspection 5' is representative for the atmsphere, sometimes slightly melancholy accent and fabulous arrangements on this album." ""Impressions of Brazil, partly due to the contribution of Ceumar, a beautiful first sequel to The Journey""
""Del Ferro made it possible to create a real Brasilian atmosphere to 'Impressions of Brazil""
"You will be lifted to other realms!" ""Mike del Ferro moves in this musical idiom like he haven't done anything else""
""The music is gaining much authenticity thanks to the Brazilian singer Ceumar. Her collaboration with Del Ferro was previously formed in Ceumars album Live in Amsterdam, they also performed together at the North Sea Jazz Festival""
""For the enthusiastic people and the novice of MPB can I wholeheartedly recommend this album. This CD is personally, for me in the top ten best albums of 2013!"" "There was a special chemistry between pianist Mike del Ferro and Ceumar in the Volga. The singer and guitarist sang and played sophisticated Brazilian listening songs where Del Ferro wove beautiful jazz lines through"
"The result is exciting and especially melodious improvised jazz with traditional Latin American samba influences."